Oft times we look at winter as a season to hold up inside our houses and wish for spring and summer. But as you see images like this you might be dissuaded from the hibernation mentality and come see Bryce Canyon in winter. When the snow flies Bryce Canyon changes dramatically as if it becomes an entirely different place. The contrast from the bright red and orange hoodoos to the brilliant white snow is something that is nearly impossible to replicate anywhere else. There are a number of activities available to do in Bryce Canyon during winter. The first and foremost is their guided snowshoeing night excursions where flashlights aren’t allowed. If you want to see the stars like you’ve never seen them before, go to Bryce Canyon during winter. Winter camping and snowshoe hiking during the day offer amazing opportunities to embrace all that is winter. As long as you come prepared with good warm clothing then you have nothing to be afraid of. As it’s been stated many times, there’s no such thing as bad weather, there’s only bad clothing. 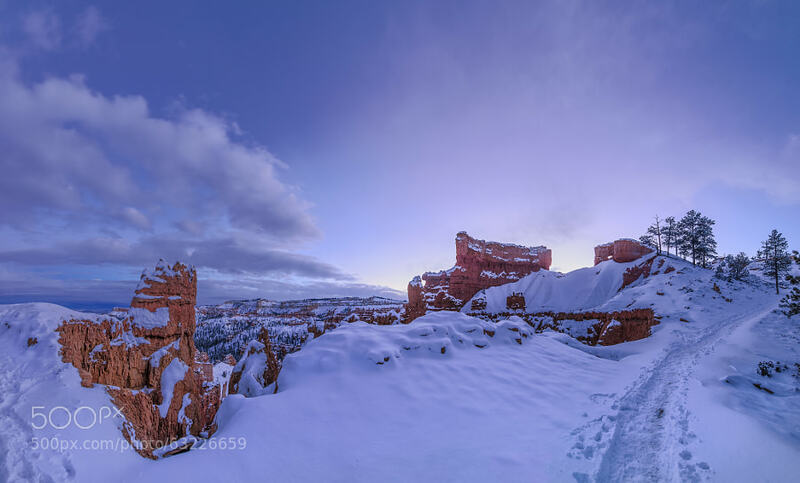 Don’t let a little white stuff and a little chill in the air stop your from experiencing Bryce Canyon during winter.